The Most INCREDIBLE form of PERSONAL FLIGHT ever devised! Fifteen minutes after parking you’re ready for flight. It’s just you and the most personal aircraft ever devised. You throttle up and start to run. Your wing fills with air and springs to life, coming overhead as you squeeze a handheld trigger to throttle up. With a few more steps you’re flying. The view is essentially unobstructed and control is precise. With experience, a pilot can fly within inches of his or her desire. The experience can range from serene to invigorating depending on what you like. Many flyers like just tooling around, enjoying a new perspective while others favor fine control, carving it up and thrilling to the G’s. The same wing that is used for powered paragliding (PPG), also known as paramotoring, can be used for motorless paragliding (PG) too. Paragliding is the simplest form of flight: no plane, no windows, just you in control, flying through the air. It launches from a field, transports easily, and is inherently stable while offering amazingly precise control. The paraglider itself has no rigid structure—you sit in a seat, suspended by lines. 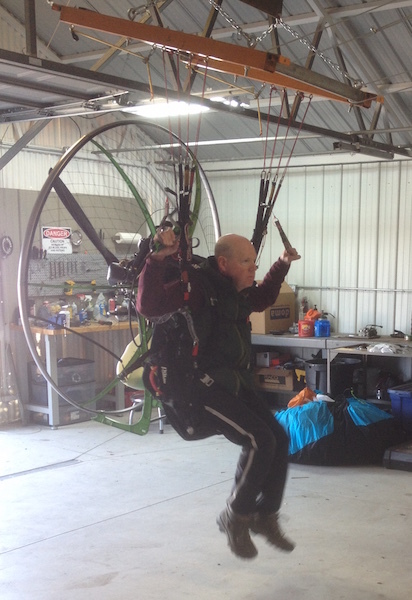 The paramotor, a backpack power unit on a frame with attached harness, provides thrust for climb and flying around. Wheels can be used that let you roll aloft instead of run. They make it easier to learn and are a bit easier on your legs but aren’t quite as versatile. which use very stable, but far less efficient wings. 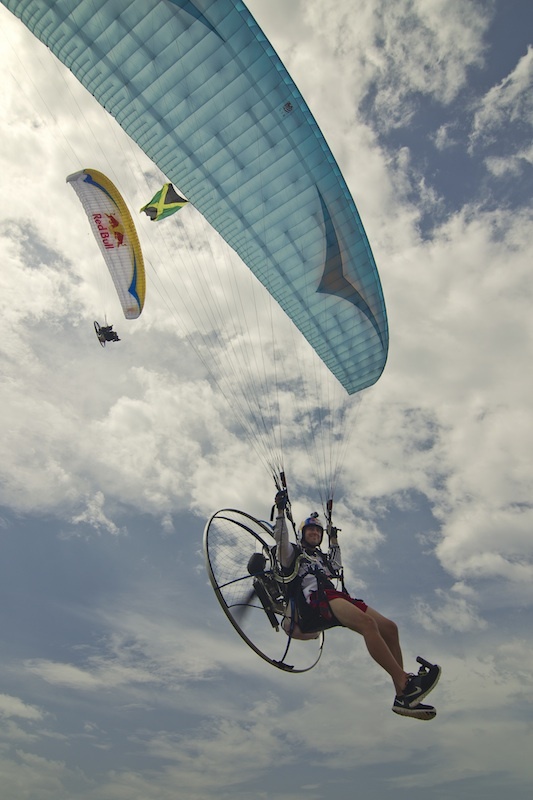 Powered paragliding is about as safe as other forms of recreational aviation. Pay close attention to your instructor and respect the prop to minimize risk. Like any recreation that involves a human in motion, there is risk. Training, and the first few hours of flight, are most critical. We estimate that overall risk is about like motorcycle riding or flying small airplanes, but more than driving a car. What risk there is comes mostly from pilot error, not equipment malfunction. A conscientious pilot with the right attitude and good instruction can make this sport incredibly safe. The motor does most of the work. If you’ll be foot launching, you must be able to walk around and handle the motor’s weight but certainly don’t need to be an athlete. The wing carries the motor’s weight. Ages range from 13 years old into the 70’s and beyond. No license is required although training is incredibly important. PPG’s are minimally regulated under the Federal Aviation Administration’s Part 103. Essentially we can fly during daytime in wide-open areas. We must avoid flying over people, near big airports and a few other locales. Private open fields, some smaller airports, and a few parks are great places to fly. One beauty of the sport is that we don’t need an airport! Most state and national parks are off-limits to us but do allow overflight. There are many groups of pilots who have established local flying sites where you can launch. Courtesy of neighbors is important so as to minimize complaints. What if the motor quits? You’ll coast slowly down and in full control of direction. The glider flies about 6 feet forward for every foot lost (a 6 to 1 glide ratio) so you’ll be descending at 4 mph while gliding forward at just over 20. You can land in a space smaller than the average yard but responsible pilots stay within gliding distance of safe landing options. A motor failure is rarely more than an inconvenience. mornings and evenings to avoid mid-day’s bumpy air. At most beach locations, you can fly all day. Some pilots seek out the stronger mid-day conditions to go soaring without the motor but that incurs some unavoidable added risk. Ask just about any pilot if they’re afraid of climbing ladders and the answer will be yes. Human nature is to be afraid of heights, a healthy response to obvious risk. Nearly everybody starts with that fear and they overcome it after a few flights. Once you internalize how secure the harness and wing is, there is little to fear. Midwest Parajet shared a post. Midwest Parajet shared a photo.